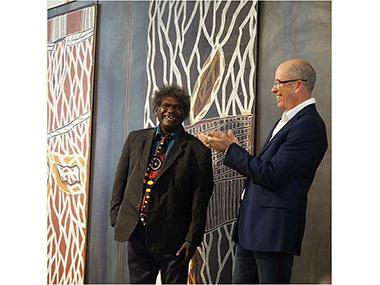 RAFT Artspace's Dallas Gold loved Tasmania but it took a few people, including the highly-regarded Kade McDonald (ex Yirrkala), to bring RAFT South into being. We were keen to catch up with Dallas about his entree into Hobart and what his vision for the new space might be. 1. We heard you had a pop up exhibition at Core Collective Architects in Hobart and they liked it so much they asked you to stay? Yes, basically. It was something Kade McDonald and I were talking about after the success of the Bangarra Boards show at RAFT during Desert Mob in Alice Springs. We both feel that Hobart is becoming an international platform for presenting art given what David Walsh has started, and the monumental achievement that is MONA. I was put in contact with the Core Collective Architects by a mutual friend, proposed a show (Mala) and they accepted. That show went extremely well - and so did the Core Collective Architects & RAFT combination, so they asked if I would like to continue to share the space. I thought about it for a day and thought it was too good an opportunity. 2. Was MONA the only reason you wanted a presence in Hobart? No, I first fell in love with Tasmania in 1982 and I've been looking at Hobart since. But MONA has been a fantastic catalyst for some very exciting change, so it's definitely influenced my decision in establishing RAFT South. 3. You've been thinking about establishing in Tasmania for 40 years? Yes. I love the landscape and the openness of the people - and the produce of course. When I first visited Tasmania I had a restaurant in Newcastle, so the great seafood and organic produce was very attractive. It is a strong country and there are strong traditions of art and craft, and art-like food was an intrinsic factor in what I did. So my first idea was to move to Tasmania (in the 1980’s) and set up a guest house for artists with a giant kitchen garden. I ended up chasing love to Darwin and have been working my way slowly south since. 4. 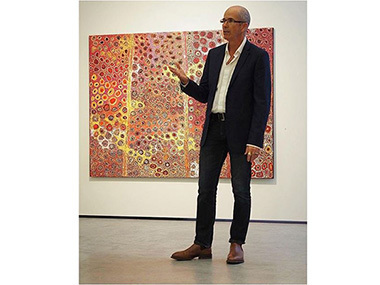 So how are you finding the Tasmanian art market so far? The market was a little nervous at first and it wasn't until well into the year that sales picked up, but there always seems to be a market for strong work - the trick is having shows of integrity with strong saleable works. There's a lot of interest locally in Hobart, it's an exciting time of change, there 's definitely is a buzz in Hobart, but it's early days. 5. What works will you bring to RAFT South? I will need to play it by ear. I am going to continue to show work by artists from community Art Centres in the context of contemporary art. RAFT has been operating for 15 years, but I am continually raising the bar and am interested in other genres of art too. There seems to be a groundswell of amazing work coming from Indigenous artists everywhere and I would like to continue to play a role to play host to strong statements coming from First Nation people. Hobart is a good place to continue to do that. 6. How regularly will you visit RAFT South? We are feeling our way at the moment so about every five weeks I am visiting there. I have two capable people, Stella Gray and Lauren Cross, running it at the moment. 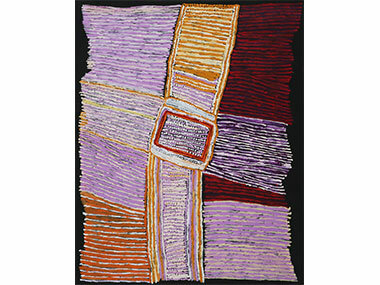 RAFT South's current exhibition featuring artists from Tjala Arts runs until Saturday 16 April. News Categories: Australia | Exhibition | Feature | Industry | What's on?